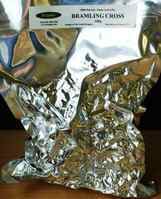 Bramling Cross hop for use in home brewed all grain beers - Vacuum packed for longer shelf life. An old established hop variety which has a strong "spicy"/blackcurrant flavour. Vacuum packed for longer shelf life. An old established hop variety, grown primarily in Kent and Sussex, which is a cross between a Goldings variety and a wild Canadian hop. It has a strong "spicy"/blackcurrant flavour. Its typical alpha acid levels are 5.0-7.0% depending on the harvest, so you may need to adjust the amounts used in your recipe to ensure that you match the target EBU value. It has a distinctive "American Beer" aroma which led it to fall out of favour, but is making a comeback in traditional Cask Conditioned beers. Bramling Cross is usually blended with other hop varieties.